Earlier this summer, we were getting these interesting looking vegetables from our CSA. This bug-like looking thing is a kohlrabi. We sautéed it with garlic once, and also put it raw in a salad. It tastes like the inside of the stem part of broccoli, and a little bit like a radish, but not as peppery. Once I stopped being intimidated about what to do with it, I actually liked it. It definitely makes for a good shadow shot. What a great shadow shot and interesting about the taste! Lovely shot - and a new veggie discovery for me. I've never had it but I love brocolli stems so maybe I'd like it! That's a scary shot but I'm with VeganCraftstic about broccoli stems. Sounds good. That makes for a very interesting shadow show. I like it! Great shot for shadows with all the line and shapes of a good composition. I love this photo! It looks like a creature that might suddenly crawl away when you're not looking. I'm interested in finding one of these to try. I love broccoli, and the stems. Beautiful photos throughout your blog. Yum! 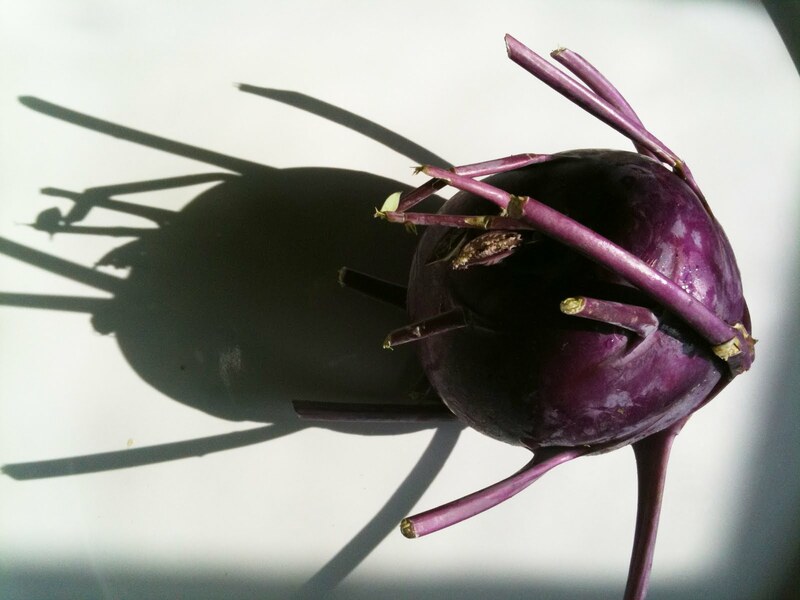 I love kohlrabi and this is a great picture! We always just peeled it, sliced it, sprinkled a little salt on it and ate it raw. An interesting vegetable with nice shadows. I like how all sorts of different fruits and veggies are making it the markets. I have never eaten kohlrabi,much less seen it. It does look like a bug. Ilove your dog, so sweet looking-of course I never met a dog I didn't like. That is really a neat shot. Cool idea!